I cooked diner tonight and it was yummy… so I decided to write it down in the blog. My son who was going to assist me in the kitchen asked to create “something with cheese” before I drove to the supermarket, so I complied and added cheese, but if you are going to cook this recipe, you will find that it works even better without the cheese. 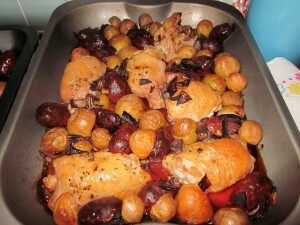 This “spanish chicken with chorizo and potatoes” is a variation on a recipe originally published by Nigella Lawson in her book Kitchen and to which I added some of my own ideas. It will cost you a minimum of effort to prepare this meal, since most of your time will be spent sitting in front of the oven and watching the chicken crackle and pop. The result tastes deliciously because the combination of the spicy chorizo and the orange peel does wonders. I used an oven-proof pyrex dish which makes for a nice presentation when you serve it at the diner table. Don’t take the amounts too seriously… this dish can not fail you. If you want, just add more chorizo and onion, or try and leave the tomatoes out. Cook the potatoes for about 10 minutes. If you do not cook them before they go into the oven, they might not be fully cooked when it is time to serve the dish. While you are waiting for the poratoes, you can continue with the preparations. Pour two table spoons of vegetable oil into a shallow roast pan or pyrex oven dish and mix in a generous sprinkle of paprika powder and ground black pepper. Add the chicken drumsticks to the oily mixture and use your hands to rub the oil into the skin of the drumsticks. If you like to keep your hands clean, you can just as well put the oil, spices and drumsticks into a plastic bag and mix the ingredients thoroughly, then dump them into the roasting pan. Make sure that the skin side of the chicken is pointing upward. Add the chorizo sausages in between the drumsticks. If you bought a large chorizo, chop it up into chunks of a centimeter first. Use a grater or a vegetable peeler to scrape the outer skin off the orange. be sure not to cut into the white inner skin! That tastes foul. We only want the orange outer skin. You end up with orange peel, or zest. Keep the zest. If you want, you can squeeze the juice out of the orange and drink it, we won’t need the juice for this recipe. Sprinkle the orange peel on top – the aromatic smell of the zest is enough to make my mouth water! Put the dish in the oven and let it cook for 40 minutes. Be sure to open the oven door from time to time and watch those chickens sizzle! If you want to try this with cheese, you have to get the dish out of the oven after 30 minutes and spread grated young cheese on top, accompanied by another sprinkle of oregano.. The final 10 minutes of oven time will allow for a nice layer of molten cheese. I served this with a green salad mixed with ground nuts, raspberries and spicy cheese (cut into small cubes) and a vinaigrette of raspberry-flavored balsamico (the salad was another idea from my son, which he executed while I was busy with the chicken). Posted: 8 October, 2011 in Recipes. Hey man, very good to know that you look for different flavors on your table. This dish looks incredibly tasty, I will try this out today for tea.